Written by Philip Howell-Williams on June 06, 2017. As followers of my blog will know, I am an avid supporter of the LGBT community and passionate about helping members of this community find solutions to the financial difficulties they face because they don’t fit the traditional family model. I am also actively involved in championing and promoting LGBT inclusion within the workplace both here at Infinity and in a wider context. 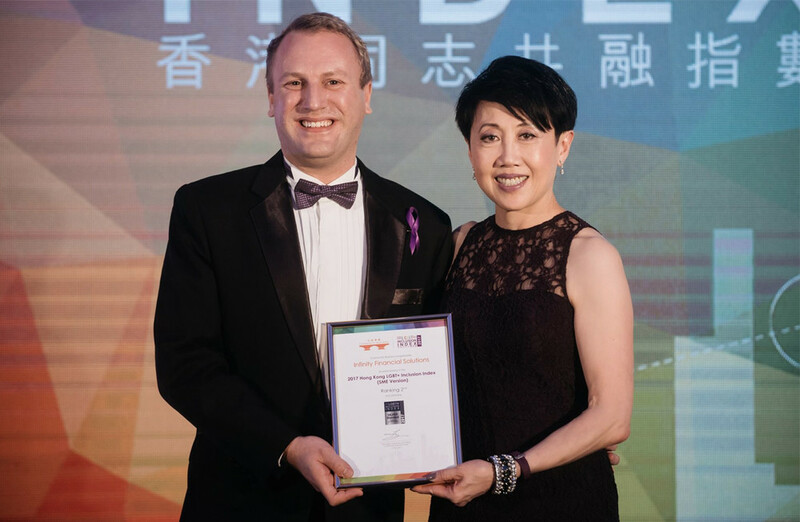 Infinity have been extremely supportive in helping me to achieve this aim and we are all delighted and honoured to have been ranked 2nd in the Community Business 2017 Hong Kong LGBT+ Inclusion Index (SME Version). Companies were ranked on a number of criteria including their equal opportunity and anti-discrimination policies, diversity training which includes LGBT+ content, the existence of employee networks and resource groups for LGBT+ employees and fostering a safe and inclusive environment. I strongly believe that companies who have a diverse workforce benefit as much from creating an open and inclusive environment as the LGBT members of that workforce do from working within it. Research proves that an individual’s productivity increases if they can be open about their personal life at work and accepted for who they are. Aside from the clear financial benefits of improved performance, inclusion also increases staff retention rates, employee satisfaction and collaboration in the workforce as well as enhancing corporate reputation. What’s not to like?! This is just the start of Infinity’s diversity journey and we hope to build on this solid base and further improve our working environment so that all our employees, regardless of gender, race and sexual orientation, feel safe, included and able to be themselves in the workplace. There is still a long way to go but this award recognises the fact that we are heading in the right direction. I would like to thank the management team at Infinity for their support and Community Business for this wonderful award. Posted on June 06, 2017 in LGBT .